Laura Mostaghel realized her desire to become a successful artist at an early age. As a child, Laura painted, sculpted and attended a variety of academies throughout the South. Originally from Atlanta, Georgia, Laura now has her studio and home in Naples/Marco Island,Florida, which she shares with her Husband, Daughter, and Son, along with many Pets. Along with fine art paintings in acrylics and oils, Laura uses clay as her canvas, focusing on tile murals and decorative painted urn vases. Laura`s work in clay is accented with 22 karat gold and kiln-fired 4 times. Laura`s appreciation of nature and love of animals is reflected in her paintings. She draws upon her surroundings for subject and scenes as well as her special inner vision of places and things. 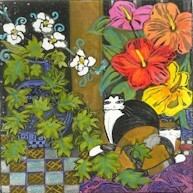 Laura`s work centers around themes such as whimsical cats , women in colorful attire, arranged in cozy interiors, or gardens with a European ambience; and magnified aspects of flowers. Laura’s works now are in permanent collections of many Celebrity/Dignitaries in the States and Europe. Hillary Clinton, Tony Blair, Elton John, Prince Charles, Clint Eastwood, Paul McCartney are just a few names to mention. She has commissioned works involving the film’ Secrets of the Ya-Ya Sisterhood’, and just recently, Warner Brothers Productions, Inc. has commissioned four of her paintings to be a permanent set scene for the movie’ Nights in Rodanthe’.